QuickTest Primer is a great tool for primer design. Paired with Primer Design/Test (Pairs) it gives you great control and flexibility for designing primers with tails, mismatches, silent mutations, one out sites and more. Once you’ve designed your primer the next step is to get it synthesized. QuickTest Primer will produce a PDF report of your primer with a single click on the Report button. 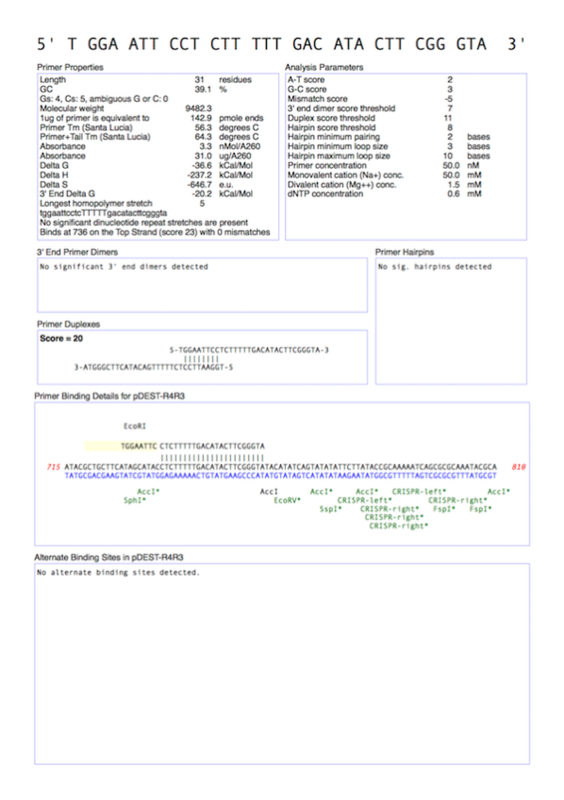 The report contains all the information you need about your primer, including sequence, any mismatches between the primer and template, any restriction sites you have created, the melting temperature of the oligo, molecular mass, %GC and much more. Great for sticking in your lab book or emailing to the oligo synthesis service. This entry was posted in Tips and tagged pcr, sequencing, weeklytip. Bookmark the permalink. Both comments and trackbacks are currently closed.